Need a custom gift for a special event? All of our cigar labels can be personalized with your own colors, text and image for no extra charge! Destination Wedding Season is here! Our sunscreen/lip balm combo makes a great favor! Need a custom design? No problem! Let us create a special design for your event at no extra charge! Announce your new or expecting bundle of joy with custom cigar labels! It's Destination Wedding Season! Beach theme sunscreen makes the perfect favor! Do you want to build a snowman? Check out our adorable holiday wine labels and take 10% off thru 12/16! Order your Holiday Wine Labels now and receive 10% off! Use code HOLIDAYGAL at checkout. Getting Married? Take 10% off select Wedding Favor Packages! Use code GALWED at checkout. Valid 11/5-11/11. NEW item in our shop! 2oz BUBBLES with custom label. Perfect favor for any event! 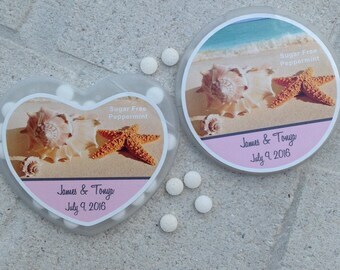 Our waterproof vinyl tumbler labels are a perfect favor for destination weddings! NEW! Personalized Deep Eddie Vodka Bachelorette Party Label! Can be customized for Bachelor Parties too! Mini Champagne Label Sets Personalize with your own text, colors and photo! Corporate and Special Event Lip Balm with Custom Waterproof Labels Adhered. NO Charge for Custom Design! Be a "Wonder Woman" on your birthday with personalized mini liquor labels! Summer is Coming! Children's Birthday Party Sunscreen. Customize with your own colors and text! Our cigar labels can also double for a Twix candy bar label! 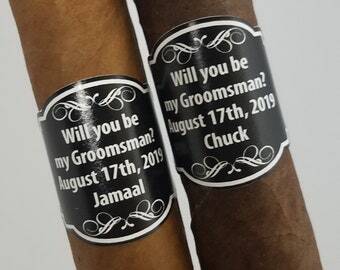 Will You Be My Groomsman, Best Man Cigar Labels! Labels can be personalized with each person's name for no extra charge! First Communion Mini Champagne Labels Waterproof, custom cut to shape. Personalize with your own colors, text and photo. Our new mini liquor bottle and cap labels set doubles as a favor and table seating organizer for your party! Personalize for ANY event! Hello Aloe! 2oz Aloe Vera Gel personalized with custom waterproof labels! It's engagement season! ️ Celebrate with a personalized Save the Date wine bottle label. Customize with your own text and colors! Personalized photo wine label makes a great gift for any event! Waterproof, custom cut to shape and size. NEW! Mini Wine Bottle and Cap Labels Set. Fits Sutter Home 187ml Bottles. Personalize for your wedding or customize for any special event! Destination wedding celebration sunburn? Soothe your guests with personalized Aloe Vera Gel Lotion!